Like many office workers I don't take in sandwiches made at home, but prefer instead to buy one either from the local shop or the company run deli bar. Unfortunately I'm finding that I am increasingly dissatisfied with what is on offer and how much it costs. My complaint is about two things really, first the cost and secondly what you actually get for your money. Depending on where you buy it a sandwich or baguette will cost between two and four pounds which I think isn't great value really. The dearer ones are in actually fact usually tasty and often very satisfying but having to hand over that much cash just leaves a bad after taste. With the cheaper ones you'll either end up with a couple of limp bits of dodgy looking wholemeal bread and some thin and less than appetizing filling, or even worse the lettuce monster!!! I think it's the lettuce monster that I hate the most. Why is it that sandwiches these days have to be 'filled out' with lettuce and salad stuff? 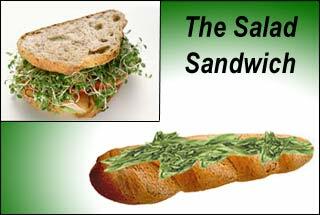 Do they think that cramming the bread full of this cheap green stuff can really cover up the fact that there isn't really much of a sandwich there in the first place? Maybe the whole world bought into this healthy crap but I sure haven't and I'd rather see a couple of decent chunks of bread filled with something substantial. You might well say that I should just make sandwiches at home and bring them in if Im not happy with what is on offer. Fair comment actually, however, the whole reason I don't is because I don't usually have the time to make them either the night before or in the morning. Besides, I'm not exactly organised enough to get the extra items with the shopping and you could say Im a bit lazy so I guess the only choice is to cough up, eat up and shut up! What a load of non-sense! I know some people that are non-sandwich eaters and look horrible and unhealthy anyway so what is the filling they use? The rolls are there only to make tummies filled and provide nourishment to the workers. And the bread is polluted by other margarines such as Stork and what have you; Eating wholemeal must account for such a low rate of naughties that cannot even be quantified. That proves that brain-bread is in full operation. Meh, Personally I make sandwiches. Bread costs around 15-20p for the day and filling can be anything from 10 to 50p. Why spend anything from £2 to £5 on sandwiches from the shop when you can pocket the money and spend it on something worthwhile? Besides, at least if you made your sandwich at home you know what you are getting! Don't know about everyone here, but there's a large 24/7 tesco near to my work, so i get the bus a bit early and have time to get my lunch at the store before i go in to my job. Its only £3 for a meal deal which is a sandwich or baguette, a small bag od fruit or doritos/other crisps, and a bottle of coke or other soft drink so any 2 of these things would be £3-4 together without the deal. I get 2 as I can have one for brekkie and then 1 later for lunch for £6 per day not bad. Only air is free on this planet now - and even that is often polluted by your goddamned cars! ~Who sells the most expensive Roll and Sausage? The Deli bar (posh name for canteen) in my company charge £1.35 but everywhere else in town is £1 or less, even KFC and MickeyDs have better offers. I can get a Roll for £1 in the tourist town of Luss on Loch Lomond! I love bringing my own packed lunch into work, knowing I'm saving a fortune. "MOST" takeaway outlets "ARE" a Bloody ripoff! Domino's being the worst, £16 for one pizza! I was put off going to subway when a worker sneezed all over the bread rolls. He turned around to sneeze so as not sneeze all over the customers but still, I was not gateful to the extent where I was willing to eat his snot. I was the only customer who left the queue so I suppose the other customers enjoyed a Subway Melt and a Meatball Marinara with fresh snot that day. Prices are set to what people are willing to pay. The demand is there, so why would they lower their prices? Don't like it, don't buy it. Confused, stay confused mate, if your confusion to date has got you a petrol station. I just lost 30 seconds of my life reading that utter tripe. Just wondering, I own a Petrol Station, somebody was in trying to sell sandwiches, what should I profit should I get off each sandwich, somebody said 15%, is that enough??? The rolls in Subway are nothing like the advertised products.Had to complain on several occasions because they are flat & soggy.Best go to Greggs the bakers. If you really don't like what sandwich shops have to offer, then you know the answer - make your own!